Critics have long argued that feed-in-tarrifs (FiT) distort markets, leading to unsustainable growth. Are they right? The market for solar photovoltaic (PV) modules offers some clues. Demand for PV doubled in 2010, led by surging demand in those countries with attractive FiT. Solar PV manufacturers added 70% to production capacity in 2010 and are aggressively adding additional capacity in the expectation of continued robust demand in 2011. Their expectations may not be fulfilled. IMS Research forecasts that 35GW of annual capacity will be reached within the first half of 2011, despite installations in the same period being predicted to reach no more than one fifth of that amount. As a result, it is likely that there will be an oversupply of modules this year, leading to tougher competition and decreasing prices from suppliers. Much of the dampened demand comes from reductions in FiT pricing in those countries with the most solar installation activity: Italy, the Czech Republic, and especially Germany, which has 54% of the world's installed PV capacity. The outlook for sustained German PV demand is dim, and the rest of the world will not be able to repace that demand, especially as other countries also seek to cut their FiT pricing in the face of budget pressures and ratepayer revolt. Recent years suggest solar FiT have led to higher consumer prices and massive capacity expansion. 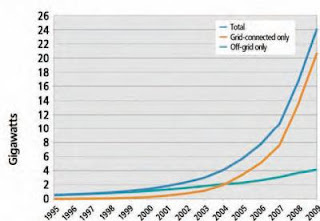 If the predicted mismatch in solar PV supply and demand occurs in 2011 these FiT will take the blame. The culprit, however, is not necessarily the FiT per se, but the inability of most government sponsors to implement realistic pricing at the outset and then maintain it. While solar PV will continue to grow overall, the boom to bust cycle will destroy many secondary manufacturers and cost jobs. Fiscal scolds and fossil fuel shills will seize on this as justification for their view that renewable energy is something we cannot afford. Sadly, this will likely lead to abrupt policy changes which will in turn wreak other havoc on renewable energy economics, making further froth and flattening likely. The spiky up and down of FiT pricing, like the hot and cold availability of investment and production incentives are aspects of the fatal lack of steady and consistent energy policy. One can't really blame the manufacturers or the buyers; they are simply doing what the policy temporarily encourages. Blame goes instead to policies that are ill-considered, implemented in isolation from broader, sustained objectives and short-term in focus. Failure of policy leads to failure in the marketplace.